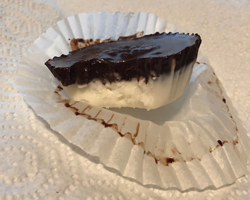 These Fat Bombs are DA BOMB! I love them. They are pretty quick and easy to make with healthy ingredients. One thing that often bothers me is that recipes that say they are LOW CARB, or KETO leave you with portions that are teeny in order to get the carbohydrate count low. For me, that is just a tease! I want to be able to have a nice size dessert portion. One thing I love about this recipe as I have written it here, along with the mouth watering flavors, If you make this recipe in 8 portions, each one is really big! Sometimes I can only eat half. I like that option. If you divide the contents into 12 portions, those are smaller but still a really nice size snack. Warm the coconut manna and 2 tablespoons of the coconut oil in a small pan on very low heat, stirring constantly until blended. Add the shredded coconut, peppermint extract and stevia and mix well. *note the peppermint is strong, 1 tsp is plenty. *I used a combination of liquid and powdered stevia and lots of it, but I like it ‘sweet’. Sweeten it to your personal taste of course. Put 2 -3 teaspoons of the coconut mixture in each muffin cup. *2 teaspoons will make about 12, 3 teaspoons each will make about 8. Divide to 8 or 12 depending on if you want small/medium or large Fat Bombs. When the Coconut Peppermint Layer is almost ready, make the Chocolate. In a flat, small pan, melt the rest of the coconut oil (4 tablespoons) and all of the chocolate at a very low heat, stirring constantly until melted and blended well. Put 1-2 teaspoons of the chocolate mixture over the first layer, the amount in each one depending on how many you have made. Add plenty of plain liquid and/or powdered Stevia to taste for sweetness. Place the tray back in the fridge for 30-45 minutes or until hard. You can use any sweetener you like, however be aware that most sweeteners (Erythritol, Monk Fruit, Swerve, Inulin, etc), all have about 4 carbs per teaspoon. Those carbs will add up quickly in the total carbohydrate count. Products vary widely in their nutritional content; note that some shredded coconut has more carbs than others, same for chocolates. Here is the list of products I used to get the carbohydrate & calorie counts I listed above.